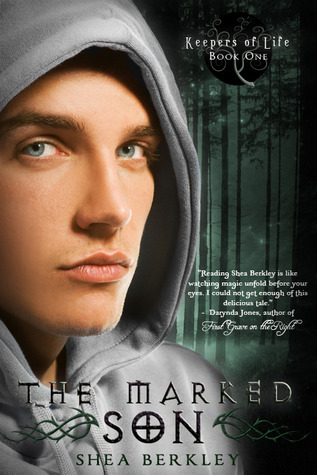 "The Marked Son" takes the Fae/Human dynamic in a new and original direction. Nothing about this book fits the mold of the cookie cutter stories involving fae that seem to have overrun YA to this point. Dylan Kennedy is a wounded soul, living with an emotionally distant mother who is searching for love in all the wrong places. He has no idea what to expect when his mother takes him to a sheep ranch in Oregon and and abandons him to grandparents that he never knew existed. Couple this with his seeing the "girl of his dreams" in the woods behind his house, and a strange new allergy to iron and you will soon find yourself on the road to story nirvana. Dylan is a good guy with a little darkness around the edges. He is flawed, but not in a way that drives people away from him. It is his need for love and acceptance that drives him to the friends and romance that he finds in this tale. Kera lives in the world of Fae, and she is in trouble. Her land is being stripped of its people by a tyrannical leader who is bent on racial purity. He has embarked on a campaign of murder, killed all those he deems to be "half-breeds". As if this is not enough to deal with Kera also finds herself drawn to cross the veil into the human world. Drawn to the dangers of possible discovery. Drawn to Dylan. This story is one that captures both your heart and imagination from its opening pages. It manages to combine the real life issues of absentee parenting, insecurity, emotional development, and self acceptance in the role of Dylan; with the damsel in distress flight and fantasy that Kera and her world offer. This is a marked change from most stories of this genre in which the two worlds may meet, but they never truly interact. The romance in this read is really sweet. Dylan and Kera really are given time to discover their feelings for each other, rather than being swept into the whirlwind of a "love at first sight" plot line. This gives readers a break of sorts when other aspects of the plot reach their peak. The pacing of the story and the fluid way in which it is written make plot twists and character development very easy to recognize and follow. Although the fact that Dylan is written in first person, while Kera's story is narrated in third, does take a bit of getting used to. This is a very well written book and one that I am happy to report is the first in a series. This reviewer can't wait to see what the fates have in store for this cast of players in later parts of this saga.